Yeah and I would still keep information and load, temperature, etc. like the old interface in the lee above. I really like this new interface. How can I install it on my existing PiHole setup? Our current PHP code base has grown organically and has made adding features more difficult than we’d like. Faced with rewriting it, we decided that strictly splitting the code into an API and client side code would be the most beneficial. Of course all of this is possible while using PHP, but there is more room for growth with this approach. The number of PHP developers is still large, but PHP is falling in popularity and we haven’t seen a huge amount of people flocking the contribute because it’s in PHP. We’ve also seen performance issues with PHP, mostly around the Query Log due to its need for high data throughput and general page load speeds. We are developing an API which will communicate with FTL over a more efficient layer than what PHP was using, and it will be able to do it quicker than what PHP could achieve. PHP was a slow middleman in the process of connecting the web interface to the client, and the API will bring a more modular and flexible development process to the project. The load will not shift from server side to client side as we are not making the client do much more work than it currently does. The amount of traffic should not be much different. Also, most users run Pi-hole on a Pi, and we want to respect their more limited processing power. Removing PHP helps remove one of the more troublesome dependencies in terms of support and allows us to create that beautiful and simplistic web interface more easily and quickly. The API will be much nicer and more standard than the current organic one. Looks nice. I’d like to see more of the demo interface. Any password? The login page is just for looks right now. Thank you for your answer and time. 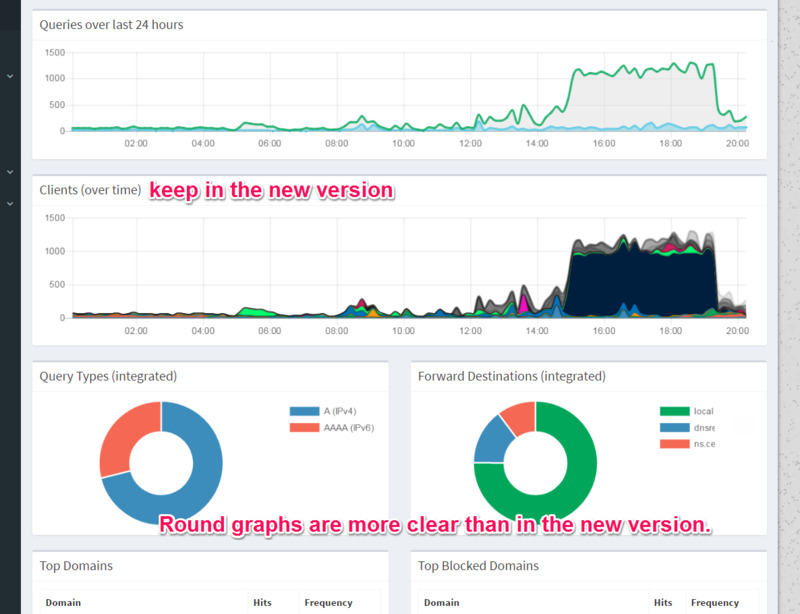 I have looked into the workings of pi-hole some more, besides just using it with great appreciation. FTL is a second part, complementing the core. So, to eliminate PHP completely, you need to be able to connect the web interface to FTL without the (current) use of PHP’s sockets. Currently both the old PHP way and the new FTL way of getting statistics rely on that PHP socket. Are you guys planning on using a JS websocket to connect the new web GUI to FTL? This would require FTL to have websocket code. A bit more code. But, you could let go of PHP so you win a lot too of course. Yet, you can’t just make a browser connect to anything. You can only upgrade a HTTP-request, so this would mean the webserver needs to be able to handle websockets, plus… for the webserver to then communicate with FTL. This would require lighttpd to get some custom work done to it (for the lighttpd<>FTL part) leaving nginx and apache to be no longer an option, no? I’d love to hear if I see the big picture of the workings right, and if my conclusions at the end are right. Most likely I’m still missing something. Hopefully one of you can tell me. I’m especially curious about the (I suppose) JS to FTL connection. It handles the core routines such as gravity, installing/updating/reconfiguring Pi-hole, managing the lists (white, black, etc), managing access to setupVars for the PHP web interface (this may be moved later though), chronometer, checking the block lists, and some other utilities such as pihole -t.
Core Pi-hole does not have any services of its own (besides dnsmasq and lighttpd). You got FTL’s part right. It provides statistics about the logs generated by Pi-hole Core (dnsmasq). These statistics are used by the web interface and chronometer. Before FTL, PHP would have to parse the dnsmasq log for every query (verrrrrrry expensive and slow). The PHP web interface has an API file (api.php, which uses api_FTL.php) which connects to FTL over a local socket to get data from it to pass on to whatever was calling the API. We’re developing an HTTP API which will connect to FTL via a Unix socket using the MessagePack protocol to efficiently stream data. Since it runs server-side, it will take the place of the current PHP API, and should be faster too. We considered developing the HTTP library in C inside FTL (and even implemented most of it), but we decided to move that HTTP API functionality to a new program. The reasons for this decision were that we felt that FTL should focus on generating the statistics and implementing a web server in C is not the best idea (especially if we want to easily add advanced features, and other languages are better for that). We haven’t decided when to fully announce the new API, but we hope it will be soon. Thank you for getting into details. I’m learning and understanding more now. The new component (lets call it Web-API) will use a socket to talk to FTL on the same machine. It uses MessagePack inbetween the two. Cool. How is the Web-API connected to the Web-GUI though? The GUI gets served by a webserver, and it could request stuff through the webserver obviously. But is it going to talk to the new Web-API around the webserver? through the webserver? Anyway, agreed in this case that PHP is rather large for the simple job it has in pi-hole. But I see more oppertunities to make it lighter and faster even after PHP is gone. You said you don’t want to create a webserver in C so you can profit from mainstream techniques later on. To me, if the situation above is right, I would be thinking; let’s integrate a small simple webserver into the new Web-API. Just serving the few pages the Web-GUI offers, the Web-GUI right now doesn’t require any fancy stuff as of now. 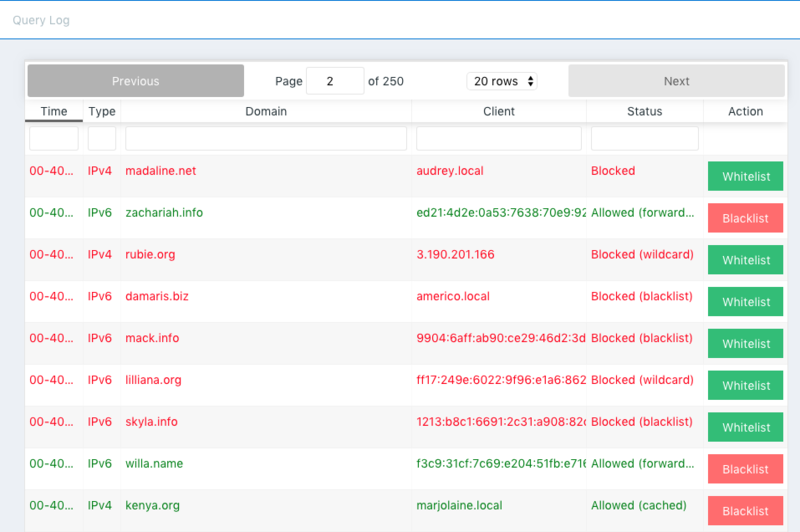 This way you can get rid of any 3rd party webserver overhead too. Plus, the only thing that should be interesting to have is the powerful and relatively new websocket-tech. Instead of AJAX polling, you can very easily push new stats from the Web-API to the Web-GUI. And the other way around, a few post events from the Web-GUI back to the Web-API. Then the Web-API can fire off core bash commands or talk messagepacked-sockety stuff with FTL and thats it. PS: in the future, SSL would be nice. But since certs in a closed off network are a thorn in developers’ eyes for years now (self signing, devices nagging about it), I don’t see that getting solved anytime soon. The web interface will communicate with the API via HTTP requests (the API will be exposed on 0.0.0.0:some_port). We’re looking into a few configurations, including serving the web interface through the API like you were thinking (therefore putting it on port 80). That would allow us to not require even Lighttpd, and users can do a reverse proxy to put it in other configurations. I’m hoping to have a page that just shows me the blocked urls in close to real-time via ajax, so I don’t have to refresh manually. That might be something that an API could expose for you. We’re in the concept stages of looking at ways to get that information to users and it would provide data in a structured format when queried. Could you possibly add a few lines to the readme with a developer quickstart guide? This seems like a great project to get familiar with React, but I am a bit out of the loop on the details with the node toolchain. A few quick points on how to build a dev environment would be great. 1 commits changed 1 files with 24 additions and 1 deletions.